Finkelstein, Maxwell W.. "Pacific Rim National Park Reserve". The Canadian Encyclopedia, 25 January 2018, Historica Canada. 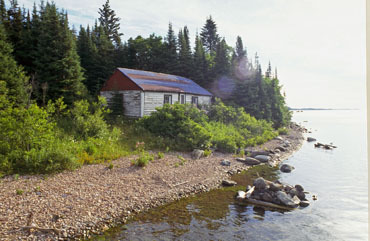 https://www.thecanadianencyclopedia.ca/en/article/pacific-rim-national-park-reserve. Accessed 25 April 2019. Pacific Rim National Park Reserve (est 1970, 285.8 km2) stretches for 105 km along the rugged west coast of Vancouver Island. Pacific Rim National Park Reserve (est 1970, 285.8 km2) stretches for 105 km along the rugged west coast of Vancouver Island. It comprises 3 sections: Long Beach, a 16 km sweep of surf-pounded sand and rock; the Broken Islands Group, including more than 100 islands accessible only by boat; and a narrow strip along 77 km of coastline that includes the challenging West Coast Trail connecting the villages of Bamfield and Port Renfrew and an inland wilderness watershed known as the Nitinat Triangle. Each unit is separate, with its own special character. 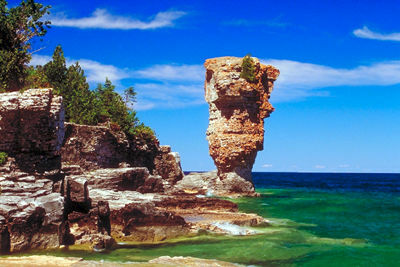 The park is unique in that its boundaries extend offshore to the 10-fathom line to protect the marine environment. Heavy rains and mild temperatures year-round have produced a dense coastal rain forest of Sitka spruce, western hemlock, Pacific silver fir and western red cedar. The forest, framed to the west by the ocean and to the east by rugged mountains, is home for black bear, black-tailed deer, cougar, marten, otter and squirrel. 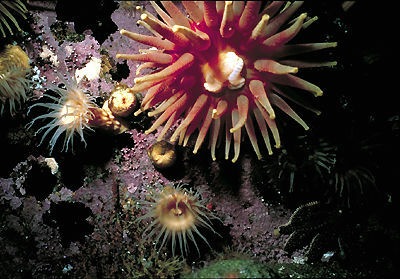 Offshore the dense forest of giant kelp is home to an amazing variety of fish and invertebrates, eg, giant octopus. Tour Canada from SpaceThis website features an interactive map linked to spectacular images of various Canadian locations taken by Canadian research satellites. From Natural Resources Canada.